As today is National Pig Day, I think it’s appropriate to share this interview with a chef who truly appreciates the pig. I split this interview into two posts because of its length. Make sure to come back tomorrow to read the second part! “The chef really likes pork, doesn’t he?” This remark comes from my customer as he returns the menu after ordering. “Yes, he certainly does,” I reply. We do have a plethora of pork items on our menu at any given time. There may be pork chops, braised pork cheeks, bacon hash, brussels sprouts with bacon, mixed vegetables with bacon, various pastas with bacon, pork tenderloin…must I go on? I’m surprised Chef Anthony Prontelli hasn’t snuck pork products into a dessert yet. Or…has…he? I’ve always been amused by, and curious of, his pork obsession. My co-workers and I often make joking comments, especially on the debut of new menus, which never fail to highlight swine, as if it were divine. Chef’s answer is always, “Bacon makes everything taste better.” True. But his connection goes far deeper than I ever would have imagined. Chef Anthony takes time out of his hectic schedule to help me snout out the dirt on why pork gets him squealing. Let’s start with 3 words: Swine Is Divine. How does that make you feel and what does it mean to you? Outstanding! I think everyone should eat pork. Pork is one of those meats that is very under-appreciated by a lot of people….people think of pork when they were kids…where pork was that kind of a dry, shoe-leathery, no flavor product. I think it’s come so far….it needs to be appreciated. It’s probably the most versatile meat a chef could make because you can do everything from dry it to cure it to soak it to confit it, roast it, braise it. What are some of the biggest misconceptions about pork? Years ago, probably back in the 50’s and 60’s, pork was the meat to eat. It beat out chicken, it beat out beef…pork was the way to go. Then I think in the 70’s, chicken made this huge comeback and took over everything. Really wiped pork out. So all the pork companies came up with this big promotion, “The other white meat.” They re-engineered [the way they were raising pork] so it was 30% less fat, so they could compete with chicken. The problem with doing that is they dried it all up…took the fat out…less marbling in the meat…so you got flavorless, dry pork. That, and people think you still have to have pork well-done. You’re Tuscan. Is your obsession an inherited phenomenon? Are many Tuscans enamored with pork? Yes. You can do so much with it. From snout to tail, you waste absolutely nothing. So pork is very big in Italy, obviously….prosciutto, pancetta, sopressata, cacciatorini…it’s all made out of pork. Pigs were a very big item to have because they were so useful. Porks eat whatever you give them to eat. In Italy, we used to have pigs. The pigs ate whatever we didn’t eat at dinnertime. So they ate healthy, healthier. Because they ate human-grade food. Exactly. Would you have a pig as a pet? Or would you be too tempted to eat him? No, I would [have a pig as a pet], those little teacup pigs? They’re cute as hell. When I have money to waste, I want to open up a pig farm. A real, high-end pig farm, kind of going along with the Berkshire, Kurobuta pork…top-notch pork. The great part about pigs is whatever you feed them, that’s the flavor the meat takes on. If you feed them nuts, your meat is nutty. If you feed them fruit, it’ll be a little bit sweeter. Which is great because you can literally gear it to how you want your pig to taste. What’s the craziest think you’ve ever done in the name of pork? Meaning….? Um…Okay, well, your tattoo? It’s not an image you see everyday on someone’s body. How did it happen? It evolved a little bit. 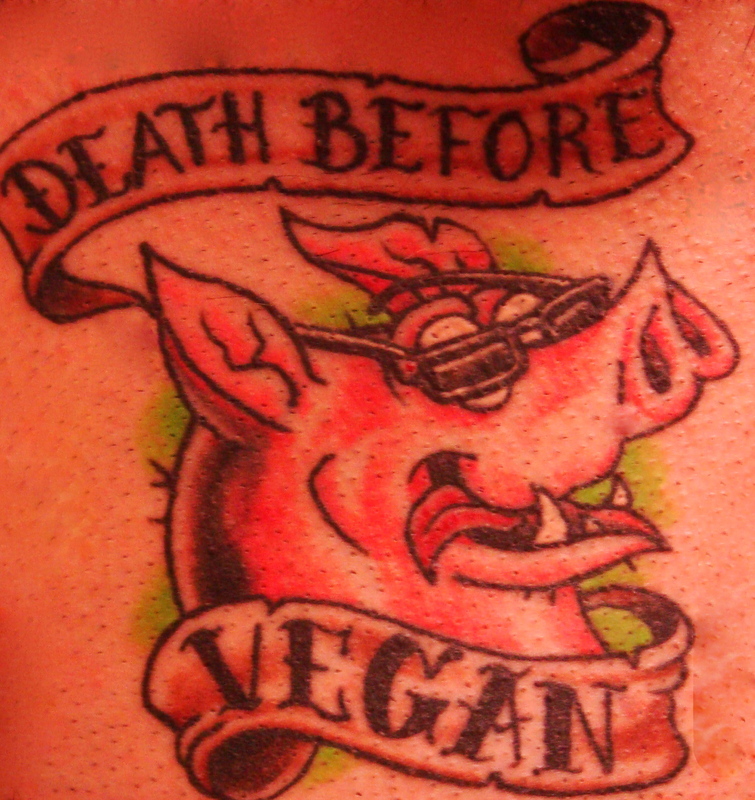 I definitely wanted to get a tattoo of a pig. Obviously I enjoy cooking pork and eating pork. I thought I might as well give it a testament. So it was either going to be this or I was going to do the actual diagram of a pig, kind of sectioned off into portions. And have them all written in Italian, which I still might do later on. None of my other tattoos are playful or colorful, you know, they’re just more serious. This one is more of a cartoon, it’s playful. This is “I’m king.” So it’s not “I’m stuffed and I’m on your plate,” but “nobody’s better than me.” And I think he [the artist] portrayed that well. What do your family members, friends, and co-workers think about your tattoo? Are they teasing you or giving you hi-fives? Most of the people here [at the restaurant] think it’s cool. They laugh, they think it’s funny. My kids think it’s funny, they can’t understand why I tattooed a pig on me, but they think it’s funny. My neighbor kind of looked at me a little strange (laughs), but I think he knows my infatuation with pork. I think for the most part it’s pretty well received and if they know me, they understand. In Part 2, you’ll learn more about Chef Prontelli’s experience with fresh natural food, his background, and of course, his love for the pig. Awesome interview! I actually feel more permission to eat pork now! I always had it in the back of my mind that it wasn’t good for you…now I can’t wait to eat a pork chop! Thanks for the comments, Elizabeth. Yes, pork is healthy. It’s gotten a bad rap in the past, like eggs, and we still remember the negative media around it. As with any meat, it’s important to make sure it’s a quality product. Factory-raised animals give us very different meat than animals raised the way nature intended. Make sure to buy pasture-raised pork–it’s better for the animal and your health!